Is UWinIt a Scam? Read 10 Reviews! Prizes: Cash, iPad, Macbook Air, gift cards, etc. 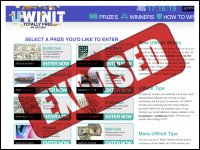 UWinIt Exposed — What Can I Win at This Free Prize Site? Do you have the time to do into a website each day and click, click, click to win. UWinIt has a good range of prizes to win ranging from $5000 cash down to $25 gift cards. Okay, you might end up with a heck of a lot of ad sponsored spam mail, but then again, the games are free and the only way to win is to play. UWinIt is a free prize giveaway site with daily prizes. They have a catch phrase of “no catches” at the same time the reality is this is an advertising site. There appears to be a limit to how many entries are permitted for each of the prizes available, though I did get a bit suspicious when all the prizes remaining have 5 or 10 entries remaining. There is no information on exactly how many entries are permitted in total. The winners page doesn’t help as it also simply posts more prizes to win. Here’s another prize play that it’s important to read the small print. UWinIt.com says you must be a legal resident and living in Australia, Canada, Ireland, New Zealand or the United States (including the District of Columbia and Puerto Rico) and must e 18 years or older. What Are the Prizes Offered by UWinIt? There are a heap of prizes to win at UWinIt.com ranging from daily to longer term. Basically, the bigger the prize the longer the contest period. Their biggest prize is US $5000 and it looks like that runs for six months. Other prizes include an IPad Mini 2, LG 49”1080p LED TV, Samsung Chromebook 2 and Amazon Gift Cards ranging from $500 down to $25. There are McDonalds, Gap and Chipotle gift cards, plus money ranging from $100 upwards. There are two $25 Amazon gift cards given daily. It looks like UWinIt is owned by Sharestakes, LLC., a company out of Hicksville, New York. There is a snail mail address and online form. There are no phone numbers or online chat. There was an email address in the terms and conditions for cancelling membership. There was some information on other sites that it might have originally been owned by Amazon.com which sorta makes sense given the type of prizes. Each of the prizes have their own terms and conditions though there are some general things that seem to apply to all. Players can submit ten entries per day (though there are a few that only allow 5). Membership can be cancelled at any time by email. Keep in mind, this site is free so there really isn’t anything to cancel except the chance to win. Each of the different prizes have their own rules though there are some general things that seem to apply. In most cases, the draws take place within ten days of closing the contest. Some of the smaller prizes take place within 1 day (Amazon $25 gift cards). Winners are notified within thirty days by email plus have thirty days to file the necessary documentation. For Canadians, there is also a skill testing question that has to be answered. Looking at complaints, things got a bit interesting. The biggest complaint seems to be for all prizes, postage is applicable. There were several complaints saying that they went all the way through an ad sponsored site and got down to winning something, paid the postage and then waited to no avail. The prize didn’t come. They contacted customer service but simply got the runaround. Is UWinIt.com Scam or Legit? It looks like the prizes directly related to UWinIt are pretty straightforward and there aren’t any complaints that players didn’t get their prizes. Though, it would be better if they actually posted some of the winners on their website. But, this site links into ad sponsors who are outside of UWinIt. There could be some question on whether these folks deliver. If you’ve got the time and don’t mind getting spam’ed with ads and other game opportunities, then UWinIt could be a place to win some prizes. UWinIt.com gets a reserved thumb’s up. If you’ve got the time to go in regularly and play and deal with the anticipated spam email from other ad sponsors, you will have a chance to win some prizes. Play daily, no problems. Have won a couple times for. Twenty $ and twenty five $. Notified within twenty four hours and check arrived within a week or less from Chase bank. Of course there are ads but. It is free to play. Without ads there would be no contest. Be realistic. It’s fun, free, and with luck great. My small winnings paid for couple great meals for me and friend. I love love it. I have fun playing the games. I win. It is legit, they get backed up though and email communication can be frustrating. Best way to contact them is thru their Facebook pages or on their sister site Winloot. I ended up messaging thru Facebook, and it was faster than email. I have won 25.00 a while back-Been playing for a good while. I WON!!!! No kidding! $25 gift card. Cool! Too bad I JUST FOUND the notification email, now 2 mos. old! Maybe they will still honor it, I will let you know! Once you sign up there is no cancelling the daily emails they send you even though there is a link that states as such to cancel. Also when you write them ‘again’ requesting to be removed from the daily emails they give a bull pucky reply that it takes over ten days for this to occur. Now it has been almost two months and they ignore my requests to the point where I am banned from contacting them. My suggestion is don’t get involved with this ‘contest’ site. Fun to play when I have time. I received a lot of emails giving me extra tokens but have yet to win. I get lots of emails indicating that I am in the running for prize but when I research it, I see the other person’s name in the winners list. So when that it is a time filler during my dialysis, I will continue to play. Good luck to me and everyone else. Hello, have been entering have not won a single cent!